I’m happy to write to you and I bring good news: an updated version of the Table of Animoog Presets, adding 572 new presets and 274 new timbres to Animoog from 6 expansion packs. This table that I’m gladly compiling for the community of Animoog players now lists a total of 3,148 presets and 5,129 timbres for Animoog. This gives us access to a large diversity of presets to explore for hours and hours. Here’s the six new Animoog packs available. The new Multidimensional Polyphonic Expression (MPE) MIDI version of the Song-Haven pack bring 50 new presets to Animoog for $6,99. We were lucky to have Steffen Presley explaining the process to configure presets for the MPE MIDI standard supported by lots of interesting controllers such as the LinnStrument and the Seaboard. Then there came the wonderful sounds of animals with the Animaal pack from Terra Nova Music which brings 55 new presets and 134 new timbres for $3,99. and it provides direct download links to these presets packs, contains guidelines for submitting presets along with some more info. Don’t forget the instructions to easily install those presets on your iPad without relying on iTunes. Players will also be happy to hear that since my last blog entry, two minor versions of Animoog have been released, version 2.4.6 in April and 2.4.7 in June, bringing minor bugfixes and one small feature for those wanting to play along with existing tracks: Animoog now allows Apple Music to continue playing when Animoog is in the foreground. Animoog for iPhone followed the same path and got the same new feature, reporting now as version 1.3.3. I read reports that the current version of Animoog doesn’t support iOS 11, Apple’s upcoming iOS version currently only available as a public beta. It’s extremely likely that Moog Music will update Animoog over the coming weeks to fix compatibility issues with iOS 11 before it launches. Dear fellow Animoog players, I have good news for all of us just in time for the holiday break: 251 new Animoog presets and 159 new timbres! The prolific sound designer Rust(i)k previously gave us two packs earlier this year, one with 132 presets last May and the other with 169 presets in July. Big thanks to Rust(i)k for providing us an even bigger playground to explore sounds with Animoog. The presets are wide ranging and their names attempt to convey the intended mood. My goal was for these timbres and presets to allow a person to use Animoog for all synth needs. Essentially, the ultimate Swiss Army synth that can produce the most lovely of etheral pads and heavenly atmospheres to the booming wobbles of the bowels from hell. The presets are categorized and arranged nicely. All the timbres are original and painstakingly compiled over the last 6 months. The timbres and presets are not lined up according to the bank number. Timbres are used from both timbre banks in both of the preset banks. Dividing them is to help not get overwhelmed with too many options. For every preset, pluck a single note, play a chord, hold it, and then sequence it. The presets are multi-dimensional in that they have a surprising variety of sounds per many of each of the presets. So treat this like an amusement park - and ride till you scream! Happy Holiday and please enjoy. Best of health for all. And a special thank you to Satri here at Animoog Love for all the hard work he does for all of us. Thanks Rust(i)k! Plenty of Animoog players will benefit from these new presets and timbres! :-) Here’s the download link for these RUST(i)K – X & K presets and timbres. 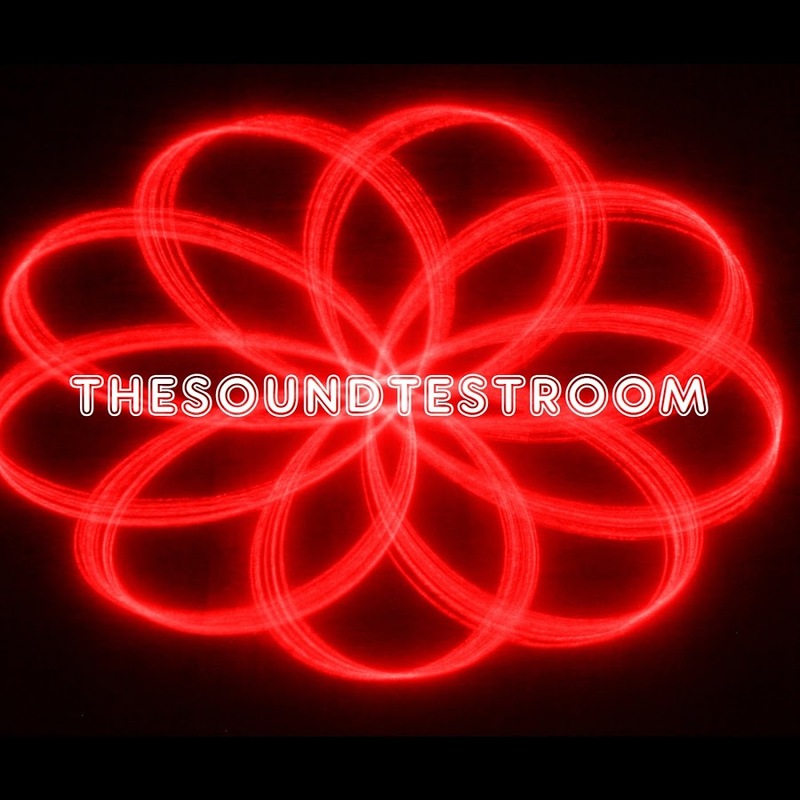 And don’t forget to contribute $5.55 to thesoundtestroom@gmail.com through PayPal. If you’re not interested in donating directly to thesoundtestroom, you can get his albums directly from Bandcamp or the albums Doug Woods made with Colin Powell. I am personally indebted to the thesoundtestroom crew: in early 2015 and without knowing me in any way, they created and published a video for my January Planet Animoog solo from the Unanimoog album, a track which made its way to the Best of Apptronica 2014 album. This was the encouragement to then create my own videos for my improvised Animoog solos. These guys inspired me. Here’s the initial Animoog demo video thesoundtestroom published in Summer 2012, not that long after Animoog came to existence! Please note that thesoundtestroom collaborators, Jacob Haq and Pants of Death are still contributing videos for the iPad musicians amongst us. Because I want all of you to benefit from these presets and timbres for the holiday break, I exceptionally did not take the time to play and publish an improvised solo with these new presets, something I usually do. I have quickly tested the presets and timbres and I can confirm they’re pretty interesting. Don’t forget the instructions to install third-party presets and timbres on Animoog. When I published version 1.4 of the table of Animoog presets and timbres last May, I wasn’t expecting a new version coming this fast. Rejoice, today I’m announcing 352 new free Animoog presets, and they’re excellent! This expansion packs table lists third-party presets and timbres that you won’t find anywhere else. 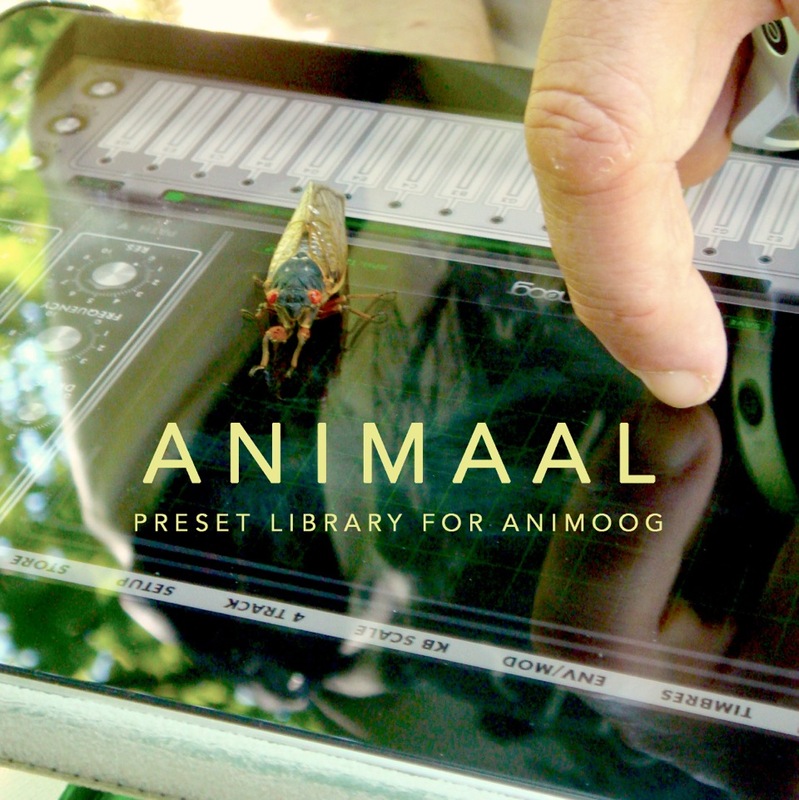 352 new Animoog presets are now available as part of this update. There’s now a total of 2,576 presets and over 4,500 timbres available for Animoog, lots of them free! Version 1.5 brings presets from two sound designers, ‘analogue, I wish you were’ and Rust(i)k. The table’s page includes the links to download/purchase the presets and timbres. The full changelog is available at the bottom of the expansion packs page. Since the v1.4 announcement, I also published step-by-step instructions to install third-party Animoog presets and timbres. Sound designer named ‘analogue I wish you were’ contacted me to share with you not one, but two packs of free Animoog presets. I’ve been playing with them the past few weeks and I can confirm that these are great presets! I’m amazed at the quality of what the sound designers amongst us are able to create for us, the players, to play with! But never stop yourself at a preview, download and install the free presets for you to explore their capabilities. Next is “À la rescousse”, an improvised Animoog solo played live with ‘analogue I wish you were’ preset named ‘PAD ramp pur’ from the ‘Retro Futurism’ presets. “La vue” is an improvised Animoog solo played live with ‘analogue, I wish you were’ preset named ‘FM PAD – no way back’ from the ‘RPG Fantasy Sounds’ free Animoog presets pack. ‘RPG Fantasy Sounds’ is now one of my favorite pack of presets. You can get the free presets directly on analogue, I wish you were’s Bandcamp page. That’s also an opportunity for you to support the sound designer with a contribution, he deserves it! After the nice presets we got from him last May, sound designer Rust(i)k offers us a second pack of free Animoog presets! Nothing less than 169 new and free presets which are, once again, of pretty good quality :-) Rust(i)k informed me that some of the presets’ timbres might be missing and may simply be replaced with Basic Sine. Click here to download the free presets. Here’s one of the numerous tracks I recorded with these presets, “Japon turquoise” is an improvised Animoog solo played live with ‘Rust(i)k’ preset named ‘Keys Iluminati’ from the ‘RePrison’ free Animoog presets pack. During an online discussion with another Animoog player, we came to the topic of which timbres are required for a pack of third-party presets to sound as intended. With this information available, an Animoog player can know in advance if he has all the required timbres before downloading and installing a new third-party pack. The table version 1.5 now includes the list of official In-App-Purchase packs you need installed for the third-party presets to sound as designed without any [missing] timbres. If you’re a sound designer that contributed one of those packs, please contact me to let me know which timbres are required for your presets and I’ll add the info for the next version. Remember that I provide a list of Animoog-focused YouTube channels? Here’s an Animoog improvisation played by Subconscience. I’m amazed at the variety of sounds and styles that can be played with Animoog. 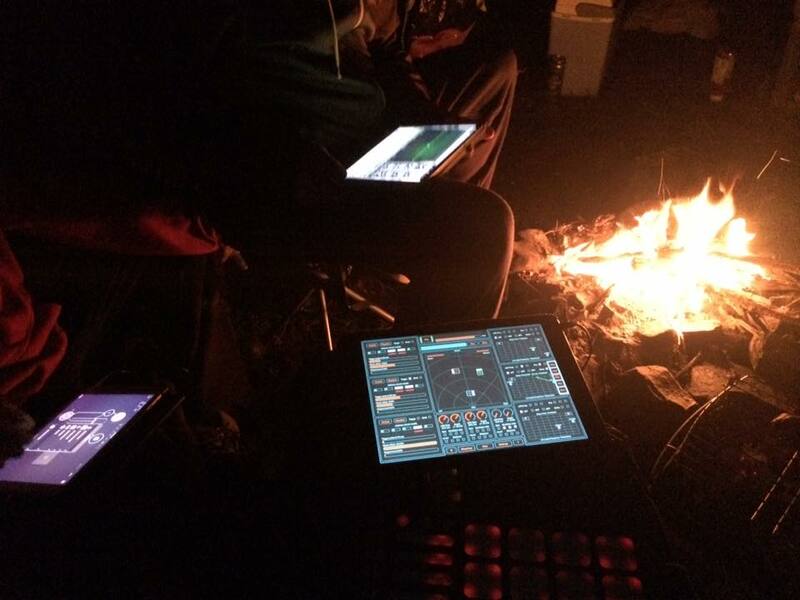 Enjoy summertime — Animoog can be played anywhere, like shown on this photo from Lukas Gec (thanks Lucas!). Dear fellow Animoog players, I’m delighted to announce version 1.4 of Animoog.org’s table of expansion packs. This expansion packs table lists third-party presets and timbres that you won’t find anywhere else. 328 new Animoog presets are now available as part of this update. There’s now a total of 2,224 presets and over 4,500 timbres available for Animoog, lots of them free! Version 1.4 brings presets from 4 sound designers: Steffen Presley, Rusk(i)k, Sound of Izrael and Subconscience. 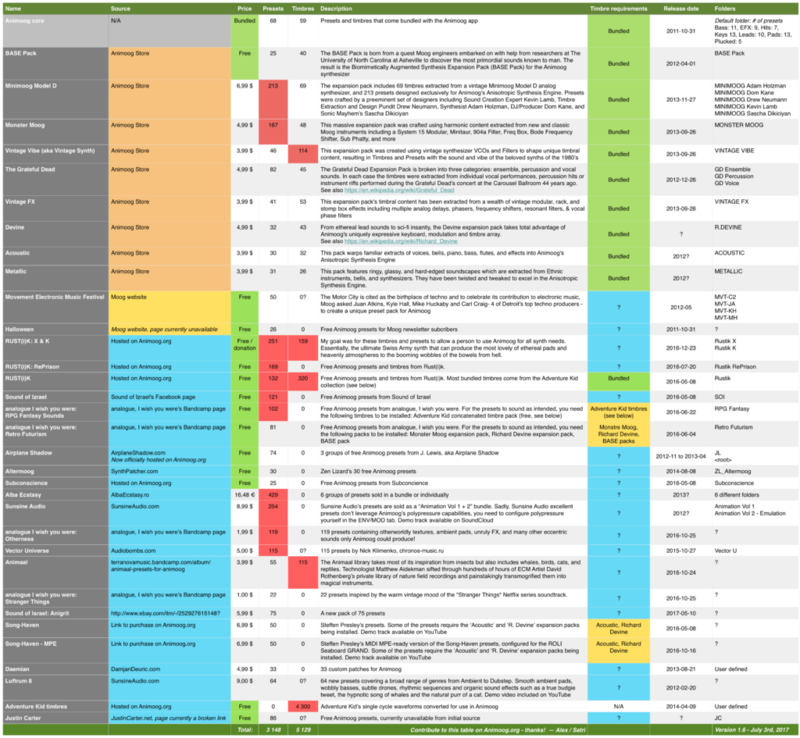 Here’s the updated version of the table of Animoog expansion packs. The table’s page includes the links to download/purchase the presets and timbres and installation instructions. Three of the four new packs are free, the fourth one being available at a very reasonable price. The full changelog is as well available at the bottom of the expansion packs page. I’m happy that sound designer Steffen Presley contacted me and that we’re now able to provide his expansion pack named Song-Haven. It is available for $6,99 by sending money directly to Steffen via Paypal. There’s a total of 50 new presets, with some of them requiring that you already purchased the Acoustic and R. Devine packs in order to access their timbres. As you can see in the following YouTube demonstration video, those are high quality presets. They just got released and I haven’t tested them yet, but I soon will! Steffen is also the nice sound designer who recently shared with us free Theremini presets. Sound designer Rust(i)k is freely sharing with us 132 excellent presets. Here’s a part of Rust(i)k bio: “RUST(I)K is currently working on several projects and remains a major part of some of house music’s greatest venues and artists over the last 20 years. He now is experimenting with a variety of musical styles and methods as the IOS music world grows by the day. In doing so, he routinely puts out preset or sample banks to various sites and several companies.” His full bio is available here. Rust(i)k’s excellent presets are freely available directly on Animoog.org: Rust(i)k presets. Here’s two improvised Animoog solos, the one I just recorded named ‘San Andreas’ played with the ‘Lead PolyAnna’ preset, and the second one named ‘Going Rust(i)k’ I made with Rust(i)k’s ‘Lead Axe’ preset. Here’s an improvised Animoog solo named ‘Fatal Duel’ I made with Sound of Izrael’s ‘R Rusty boy’ preset. Sound designer Tiziano Gileno Fasano, aka Subconscience, is sharing with us 25 free Animoog presets! Here’s Subconscience presets. Here’s an improvised Animoog solo named ‘It’s ongoing’ I made with Subconscience’s ‘Lead-polymulti’ preset. I’ll probably improve that list over time. Please understand that this list is updated only every few months. As a bonus for having read up to here, I invite you to contribute to the documentary on Bob Moog being currently crowdfunded on Kickstarter: ELECTRONIC VOYAGER: Retracing BOB MOOG’s Sonic Journey. Here’s a present for the end of the year! A major update to Animoog.org’s list of expansion packs. This is the location where you’ll find presets and timbres that don’t show up in Animoog’s in-app store. As usual, you’ll find a web version with the invaluable links, as well as png and pdf versions. Finally the appropriate presets and timbres count for Animoog’s bundled content. The table itself don’t list individual timbres categories, you’ll find them in David’ comments. Immense thanks to you David, everybody will benefit from your contributions! My honest opinion after quite a view jam sessions with the Vector Universe presets, I consider them of high interest. Of course that’s a pretty personal statement since your tastes and use cases might differ, but if you like Daemian and Alba Ecstasy presets, chances are you’ll like Nikita’s ‘Vector Universe’ presets you too. Nikita’s was very nice to provide the presets for free to the ones amongst you following Animoog.org on Twitter. Thanks Nikita. 1,713 presets, that’s how many presets sound designers gave us to explore. Thank you. Without you, Animoog wouldn’t be the Animoog I love so much today. As a mean to thank you dear sound designers and to highlight your work, I’m pleased to provide this major update to the List of Animoog Expansion Packs. Here’s two examples of improvisations done with the Alba Ecstasy presets bundle. Since stereo ping pong is abused, headphones are required. I need your help. Can someone tell us in the comments below how many presets and timbres there are in the vanilla Animoog? That info is missing from the table. Thanks! Click on the following image to head to the exhaustive list of expansion packs! Thanks to user SZak on the Moog forum, we learned that iOS 8.3, released this week, makes it more difficult to transfer presets and timbres to Animoog. For the official expansion packs sold within Animoog, restoring purchases works fine. However, for third-party presets and timbres, such as the ones we list on this page, using iTunes for such transfers is cumbersome at best. Solutions included using software such as the our wish list for Animoog. SZak also reminds us that, strangely, Animoog currently stores presets and timbres in a ‘caches’ folder, which is not backed up during normal iPad backup procedures and now with iOS 8.3, is not as easily accessible as it was. I’m happy we got recent news from Moog on Animoog development efforts, we can hope such annoying issues will eventually be fixed. 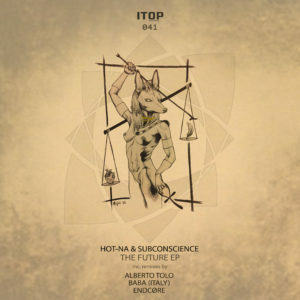 UPDATE 2015-04-24: Good news, according to Tidbits: “iFunBox and iExplorer have been updated to sidestep the new security settings, but with the limitation that they work only with apps that use iTunes File Sharing.” which the case of Animoog. I haven’t tested the new version, but those third-party solutions should work now. UPDATE 2014-04-26: Ah zut, those solutions now work again for presets, but not timbres or anything else such as recorded tracks. I’m back to hoping Animoog will support iCloud Drive or anything similar for moving such files around.